This program offers the highest level of teaching in the school and is geared towards the school’s top students. Forms from both the 2nd and 3rd degree black belt curriculum will be covered. Purple (11+ yrs old), Red (10+yrs old) and Brown program for advanced skills in balance, strength, and flexibility geared towards the development of physical confidence. Physical topics will include: agility exercises, dive rolls, cartwheels, hand stands, kip ups, jump spinning kicks, sweeps, joint locks, black belt test skills, as well as movement required for Black Belt Testing. Mental topics and conversations will include responsibility, accountability, confidence, leadership and independence. In the sparring program, students will learn how to apply what they have learned in class to a dynamic fighting situation. The main concepts of distance, timing and power will be covered in solo, two person and multi-person scenarios. Physically, students will learn blocks, attacks, footwork and combinations, however, mentally they will learn so much more. Students will learn how to stay calm when faced with adversity, the power of technique and exactness and will improve their confidence and awareness of potentially bad situations and how to dissolve or avoid an altercation. The program is not about fighting, as much as it is about not fighting. 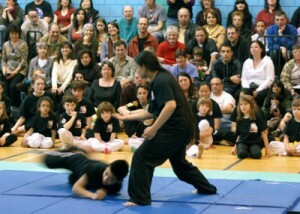 This program will teach the student how to assist an instructor in the teaching of a martial arts class. Through breaking down and teaching the basic movements each student will gain a deeper level of understanding of their foundation, grow in their confidence and learn how to positively impact the lives of others. Students will work on their ability to communicate, speak in front of a group, and learn about their own personal strengths and weaknesses. In this program assistant instructors will begin to transition from assisting to leading a classroom. 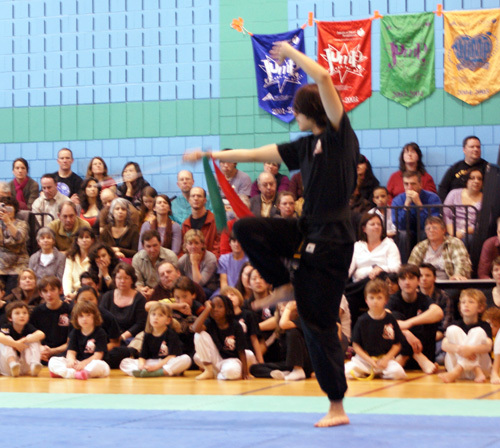 The instructor will learn how to effectively handle all aspects of the class: creating a lesson plan, coordinating assistants and effectively teaching warm-up, drills, forms, and self-defense, as well as, how to sign up prospective students, handle an introductory lesson, and balance by different individuals in a classroom setting. Instructors will work to improve communication, one-on-one and with a group, and continue their understanding of the foundation of their practice. This program is for Instructors at every level. Every January we bring in 2 new groups of students at different age groups for a 11 week introduction to martial arts. We assemble 2 different teams of instructors to teach these classes. No matter what level instructor you are, from no experience to Senior Instructor, we are able to provide an opportunity for you to stretch yourself in an environment where you have plenty of support so that you will not be overwhelmed. This is our most successful, and important Instructor Training of our year. If you are interested in participating, please contact Instructor Mark or Instructor Karen.